This week marks the five-year anniversary of my first post on the WyEast Blog, so I thought I’d share a few factoids and highlights from the past five years to mark the occasion. 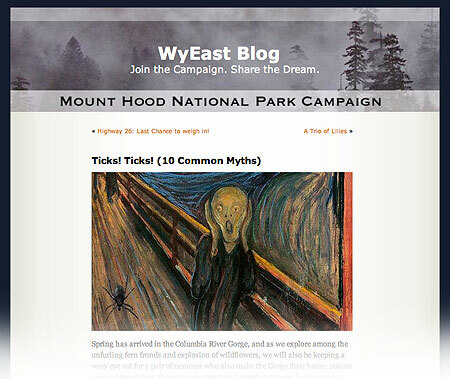 I started the blog as a way to provide more timely content than is possible on the Mount Hood National Park Campaign website and as a way to more actively champion the idea to anyone willing to read the articles! 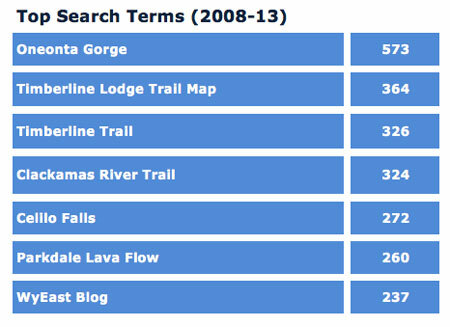 Dark blue shows actual visitors to the site (data that only became available in 2012) and light blue shows page views. On average, most viewers read about 1.5 pages, or from my perspective as the author, roughly ever other visitor takes a look at a second page during a visit. The chart also shows seasonal spikes of summer traffic — not something I would have expected, but more on that in a moment. 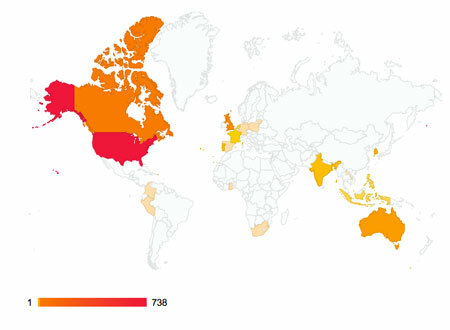 A typical day brings between 100 and 150 visitors during the off-season, and total visits are rapidly approaching 100,000 – another milestone for an oddball blog! Most of that traffic has been in the past two years. 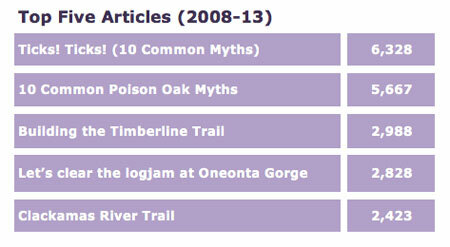 But close behind the creepy-crawly articles are posts on the history of the Timberline Trail, one of my “proposal” articles addressing some of the problems facing Oneonta Gorge and — perhaps most surprisingly — an article on the Clackamas River Trail! I’m guessing the last two are from the same person — and hopefully, the tick article helped persuade that visitor to get some medical attention… yikes! That’s probably more than enough retrospective, so if you’ve endured the charts and graphs thus far, thanks for your interest in the blog — and especially the thoughtful comments and encouraging e-mails I’ve received along the way! This entry was posted on November 24, 2013 at 9:13 pm and is filed under Blog News. You can subscribe via RSS 2.0 feed to this post's comments. 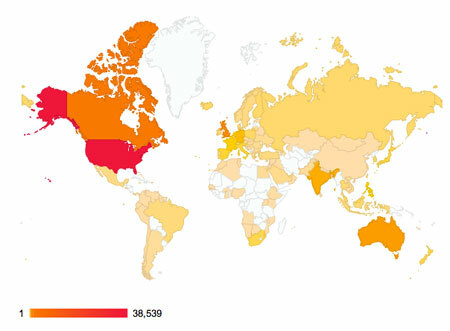 Congratulations on the amazing number of readers – far and wide – over the years. I marvel at your writing skills and strategies that capture my interest, every single time! Man alive!! This guy is continuing to amaze me. Five years of brilliance!! Thanks for getting me on-board with his work. 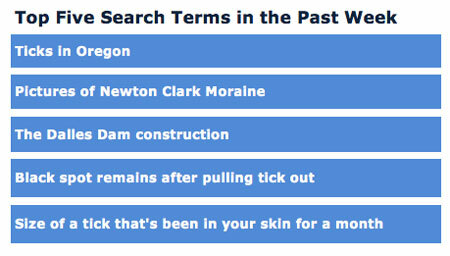 Hey Tom, I’m one of those who searched by “WyEast Blog.” The site was recommended to me by friends who, like me, love and are knowledgeable about the Columbia River Gorge. I’m working on a book on the construction of the Columbia River Gorge Highway – due out in April. Thanks for the good work you are doing! Not only have I learned some things I didn’t know before, I’ve had a ton of fun getting lost in your cyber stories! Thanks, Peg! Hey, let me know when you book is available — I’ll want a copy (of course! ), but would be happy to do a plug on the blog. I’ve got several Lancaster-oriented articles in progress that I could tie that into. I’m assuming you’ve got a copy of “Lancaster’s Road” by Oral Bullard? As far as I know, that’s the only other published book totally dedicated to the highway, other than Lancaster’s own account (and not counting the little spiral-bound “Traveler’s Guide” that came out in the 90s). Good for you for working on this! There’s also THE COLUMBIA RIVER HIGHWAY by Clarence Mershon. He follows the road from Astoria to Pendleton. My book only covers Multnomah, Hood River, and Wasco Counties, but it includes a lot more about the people involved and the actual construction, so it’s different from Clarence’s book. Yes, I’ll let you know when it’s out. I’ll post it on facebook – can I find you there? Hey, Tom. Thanks for 5 years of well-researched and well-written thought-provoking, informative, and inspiring articles. I look forward to what you have in store for the next 5. @ Peg – yes, under my actual name, even..!